British reserve crisscrossed with American verve in a service that broke molds and created new ones. Choirboys and a gospel choir; the archbishop of Canterbury and the African-American leader of the Episcopal church; a horse-drawn carriage and flowers hand-picked by the groom. 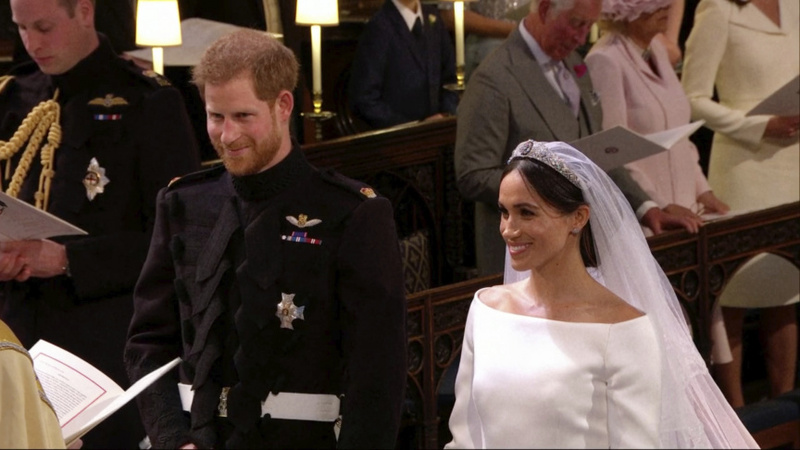 The wedding was a global event, thanks to Harry's status as a senior British royal and Markle's celebrity after starring on the U.S. television series "Suits" for seven years. Yet it seemed somehow so personal — and they both beamed like a couple who couldn't take their eyes off each other. In a rousing sermon that highlighted a bit of a culture gap between outgoing Americans and reserved Brits, the Most. Rev. Michael Curry of the U.S. stirred the congregation from its fairy-tale reverie, quoting Martin Luther King in in a sermon that had some reaching for hankies and others shifting in their chairs. "There's power in love," Curry said, his voice rising. "Love can help and heal when nothing else can. There's power in love to lift up and liberate when nothing else will." He also quoted from the Song of Solomon in the Bible: "Many waters cannot quench love, neither can floods drown it." Joining the couple were a phalanx of celebrities, many of whom shared their wish to change the world. 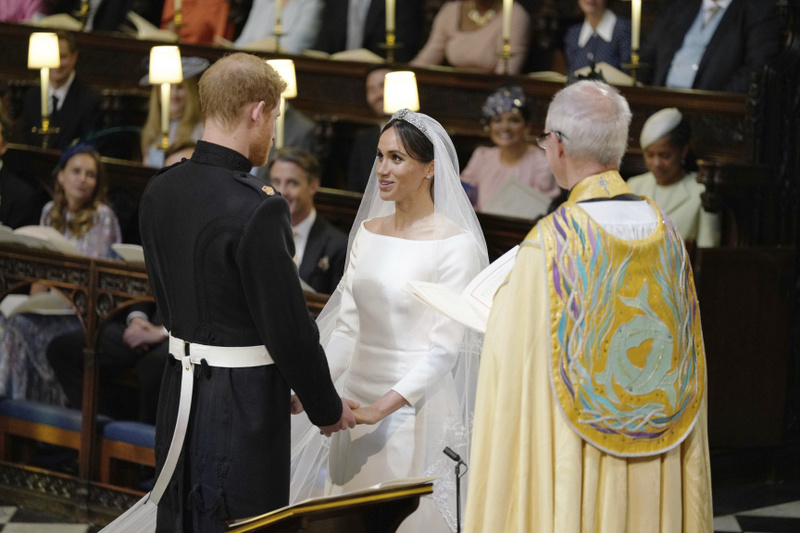 Oprah Winfrey, Idris Elba, Elton John, George and Amal Clooney, Serena Williams, James Corden and David and Victoria Beckham all watched from rows of seats in the Gothic masterpiece that is St. George's Chapel at Windsor Castle. The British weather was — gasp! — sunny and balmy, bathing the ancient stones of Windsor Castle in a beautiful spring light. Many in the throng who waited outside also embraced the trans-Atlantic symbolism of the moment. Sheraton Jones, 22, who is from California but studying in Britain, described it as a melding of cultures. "It was very touching, it's two different cultures kind of coming together, it was just so surreal," she said. 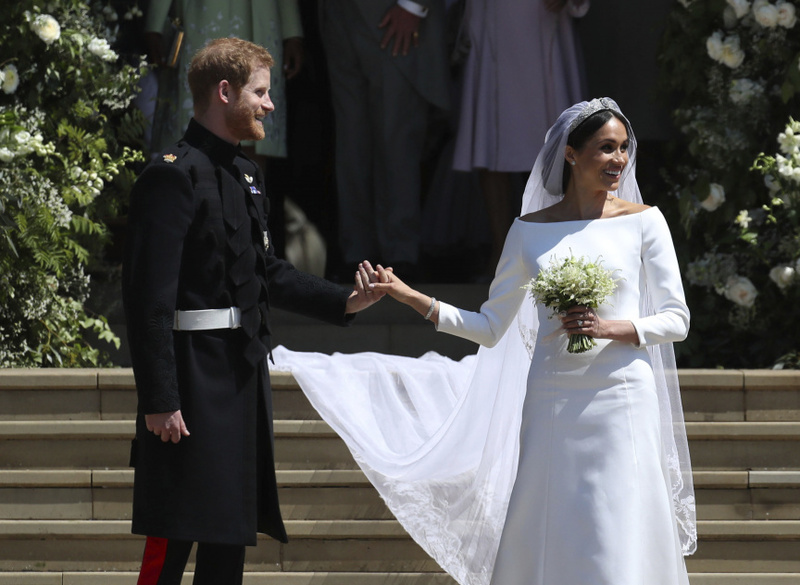 In the United States, this royal wedding was embraced for its diversity and inclusivity. "This was black history," said Joy Widgeon, who attended a house party in Burlington, New Jersey, with her 6- and 8-year-old daughters. "African-Americans were front and center at the royal wedding. This was the first time, and hopefully it won't be the last. I am here for it." Harry also invited buddies from his 10 years of military service — which included two tours of duty in Afghanistan — and from many of the charities he supports, which have focused on helping wounded veterans and encouraging a more open discussion of mental health issues. To kick off the festivities, Queen Elizabeth II honored her red-headed, 33-year-old grandson with a new title: the Duke of Sussex, making the 36-year-old Markle the Duchess of Sussex. The American actress drew raves for her sleek white silk boat-necked dress by U.K. designer Clare Waight Keller of the French fashion house Givenchy. 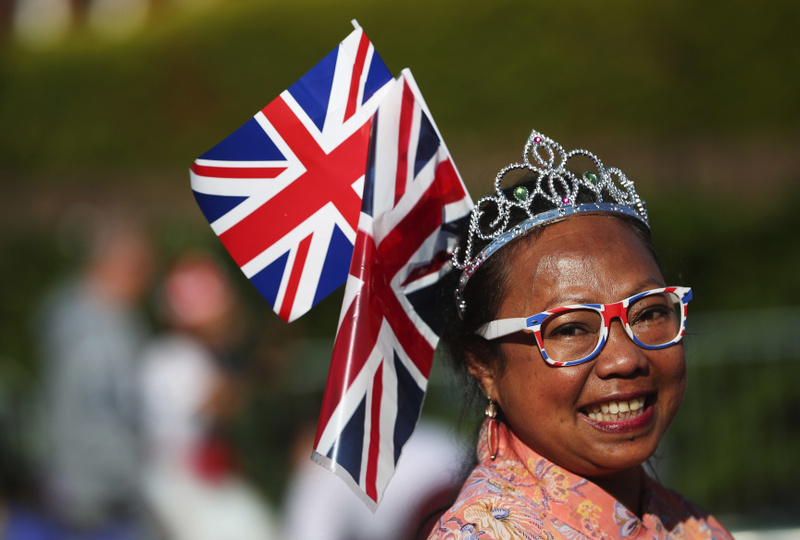 Her sheer veil — down to her waist in front and billowing for what seemed like miles behind her — carried floral references to all 53 countries in the Commonwealth, countries drawn mostly from the former British Empire, headed by Markle's new grandmother-in-law, the queen. Caroline Burstein, owner of Browns Bride, a top London bridal boutique, called the bridal gown "a nod to Grace Kelly, Audrey Hepburn and every iconic wedding we have witnessed throughout the 20th and 21st century. It's perfect for her and for the occasion they are celebrating." The palace said Markle also selected two other plant designs to be on the veil: Wintersweet, which grows at Kensington Palace, where the royal couple will live, and the California poppy, in a nod to the bride's birthplace. 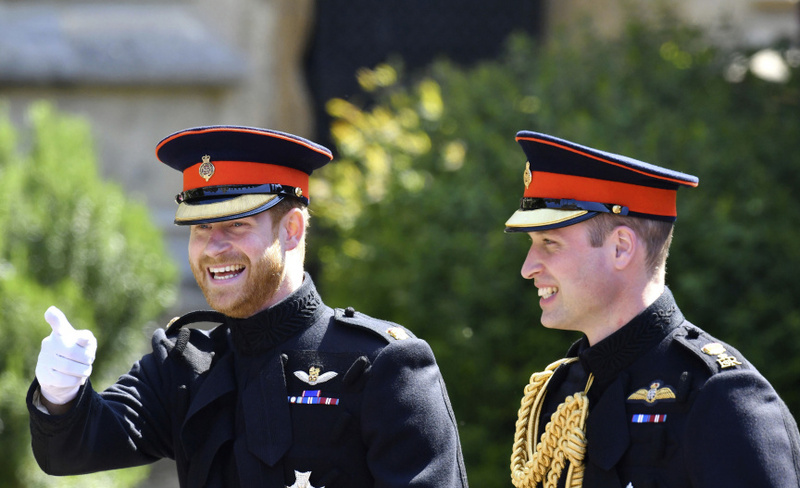 Harry and best man Prince William wore white gloves and the frock coat uniforms of the Blues and Royals army regiment, in which Harry was once an officer. Harry also kept his full red beard — a style decision that had sparked British betting earlier. 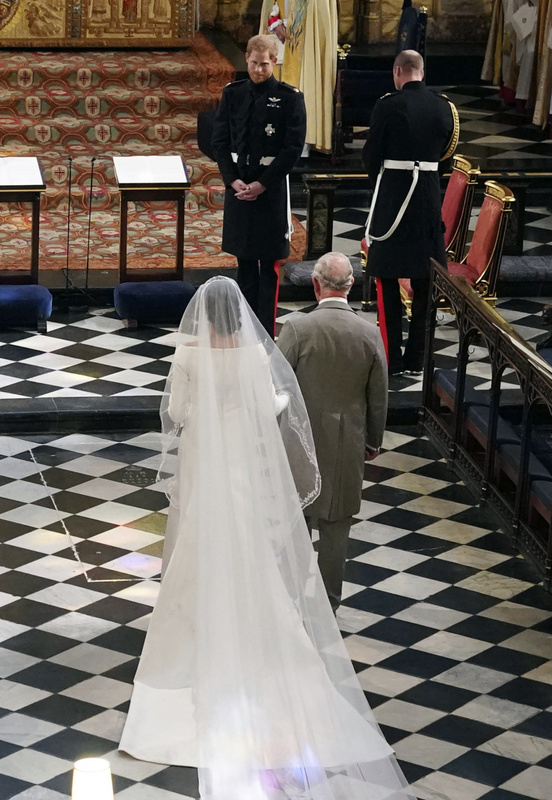 Markle at first walked down the aisle with 10 young page boys and bridesmaids, then was accompanied by Prince Charles to the altar. 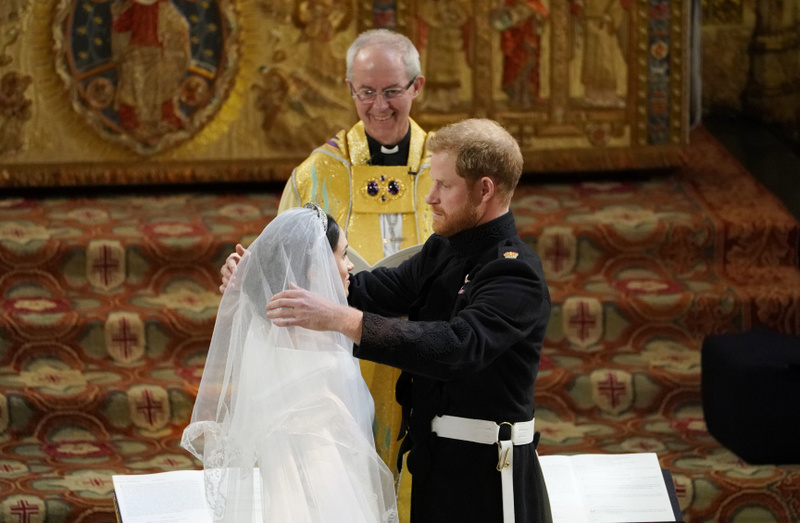 As his father and bride drew close, Harry said: "Thank you, Pa."
To Markle, Harry said: "You look amazing." Markle seemed poised and confident as she delivered her vows without so much as a quiver in her voice. She smiled broadly as Archbishop of Canterbury Justin Welby declared the couple husband and wife. Harry seemed a bit nervous, but happy. 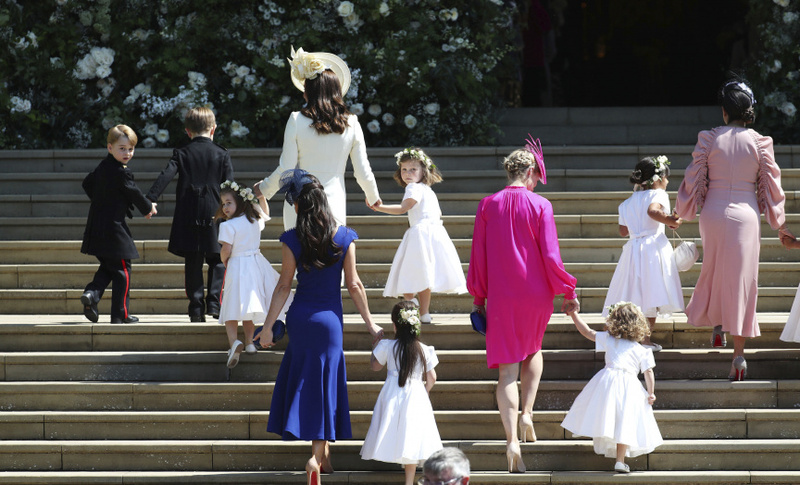 Other relatives in the ceremony included 4-year-old Prince George and 3-year-old Princess Charlotte, the oldest children of William and the Duchess of Cambridge. 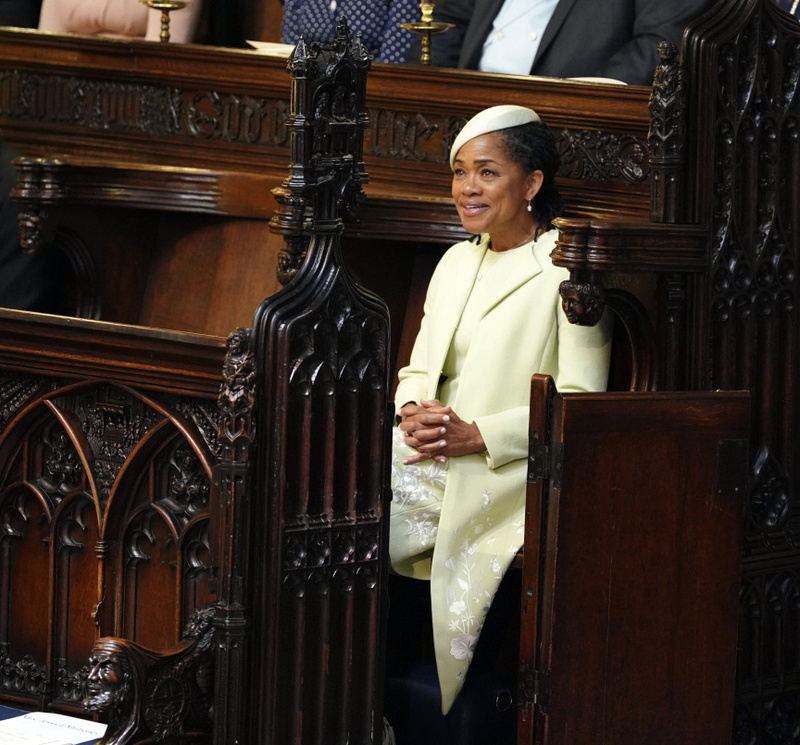 The 92-year-old queen and her 96-year-old husband, Prince Philip, Harry's grandparents, looked on with pride, as did Markle's mother, Doria Ragland, who has spent the last few days getting to know her daughter's new family. Two of Harry's ex-girlfriends were at the chapel — Chelsy Davy and Cressida Bonas — as was Sarah Ferguson, the ex-wife of Harry's uncle, Prince Andrew. As they emerged from the chapel as a married couple, the two kissed — and the crowd roared. 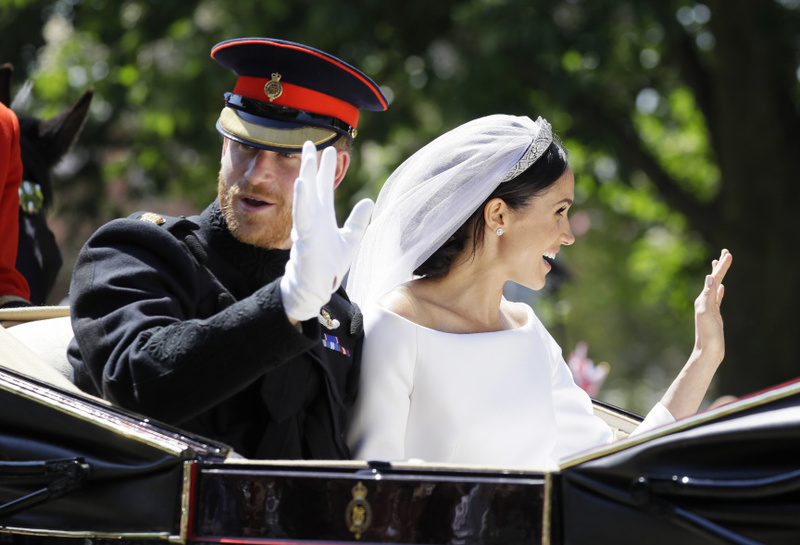 It just kept on cheering as Harry helped his wife fold her 5 meter (16½ foot) train into an Ascot Landau carriage for their procession through the streets of Windsor. Police said more than 100,000 people lined the route. The open-topped carriage was pulled by four Windsor Grey horses and past crowds waving flags and holding cellphones aloft. The newlyweds smiled and waved, smiled at each other, waved and repeated the process for the 25-minute tour of Windsor. 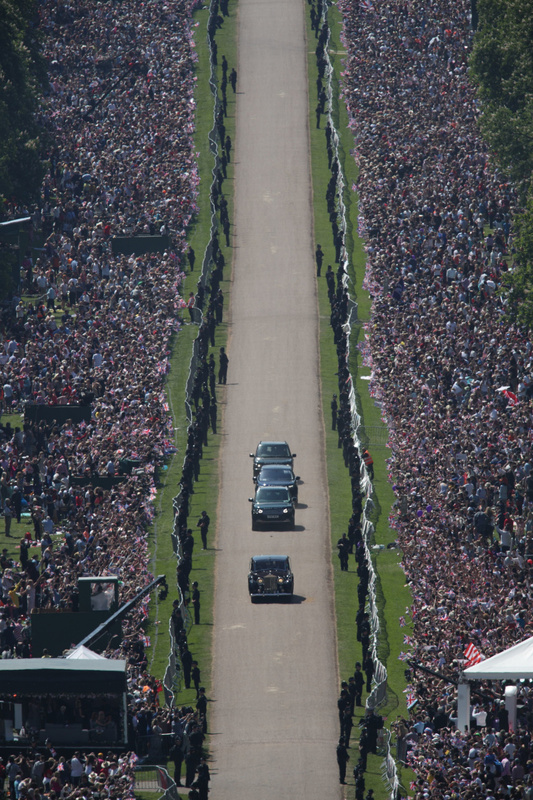 It was the crowds in Windsor that seemed to best capture the joy of the moment. Many had camped or arrived at dawn on packed trains, vying for a good spot along the procession route. They cheered and screamed and sighed as the newlyweds passed by. "I went to William and Kate's wedding, but this is a completely different vibe," said Arlene Prinsloo, who had flown from South Africa. "It's much more relaxed, and I think that reflects who Harry is." 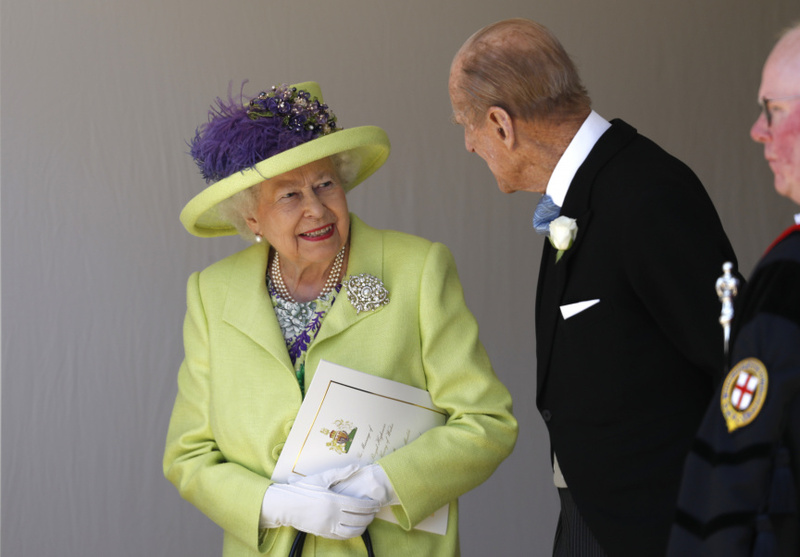 The queen hosted the first of two royal wedding receptions after the service and procession, an afternoon affair for 600 people where finger foods, wine and champagne were served. On Saturday night, a second, more lively and intimate reception for 200 people was being thrown by Charles. 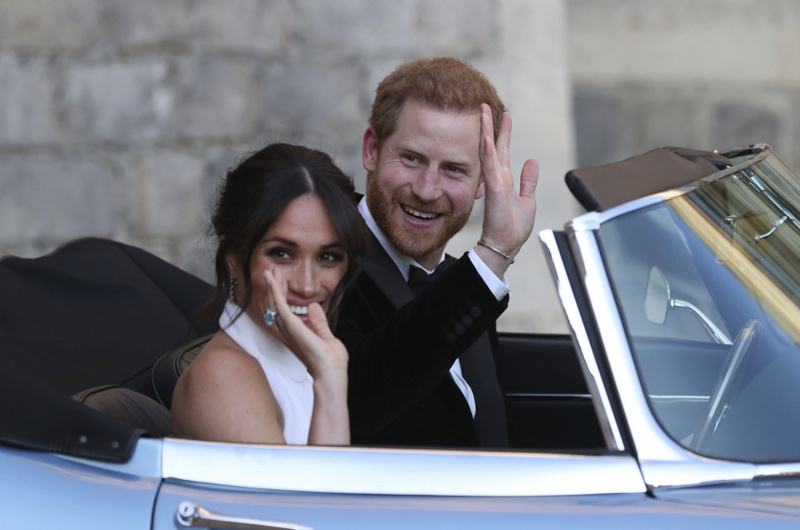 The newlyweds emerged from Windsor Castle just after 7 p.m. to head for the evening event at Frogmore House, a royal country estate. This time, their wheels came courtesy of a classic Jaguar E-Type convertible instead of a horse-drawn carriage. 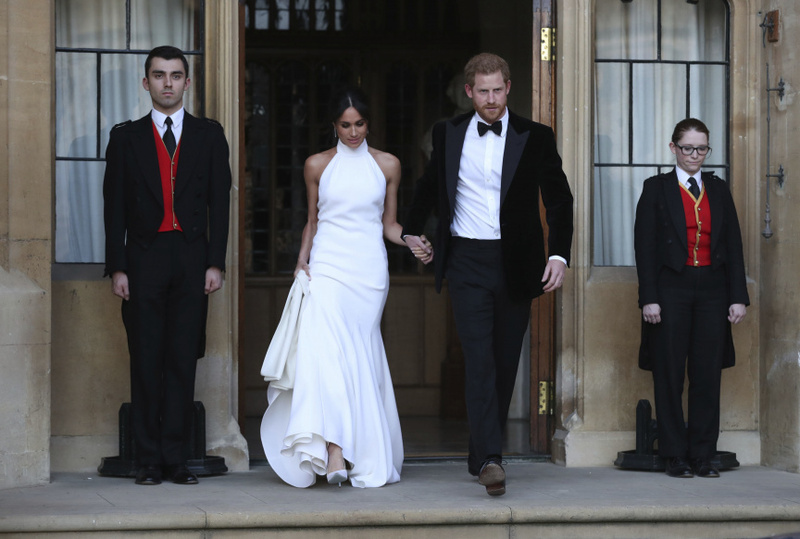 Markle traded her wedding dress for a white gown with a high neck and bare shoulders designed by Stella McCartney. Harry was in a tuxedo instead of his military uniform. Both wore big smiles as the groom opened the car door for his bride. In another break with tradition, Markle was making a speech at the evening event, according to the palace. The couple planned to spend the night at Windsor Castle and to return to their home in Kensington Palace in London on Sunday. A honeymoon is expected to happen soon, though. Harry is partial to traveling in Africa, so it's possible their destination may be somewhere there. After only two dates in 2016, he and Markle went camping together in Botswana.